came close for a look at us and Ocelot. Just a quick note to let you know that we've arrived safely in Sri Lanka. We first detected land by smelling it(!) at about 5am, a rich earth-smell on the wind. We sighted the coast about 10am but it wasn't until 6pm that we finally got the anchor down. 1,136nm in just over 9 days (5.1 knots average) is certainly no speed record, but we only averaged 3 knots for the first few days through the Andaman Sea. Winds were quite nice after that - a bit of motoring in the early morning until the winds filled in but we usually needed to charge batteries then anyway. Then the trades filled in and we always had a delightful reach during the day which would calm down a bit at night. We never saw more than 20 knots of wind and never had to take a reef in the sails. We even had glorious spinnaker runs for most of the last 2 days. All in all, one of our best passages to date. Sri Lanka has a lush, wild southern coast. 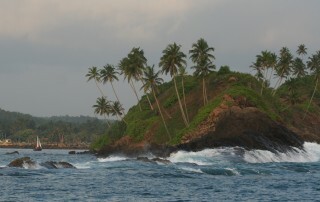 Here, the headland at Weligama Bay. We didn't quite make Galle (we'll go there tomorrow) as the sunlight was fading. We're tucked up in a quiet bay surrounded by lush vegetation next to a fishing village about 15nm east of Galle. 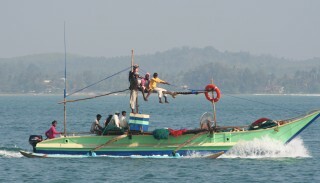 The fishermen are very curious about us and ask for cigarettes, but don't mind that we don't have any. I think it's just a friendly form of greeting for them.